Presented here, a wonderful Tinsel Picture in an unusual color palate. The colors really "work" in this unusual but stunning presentation. 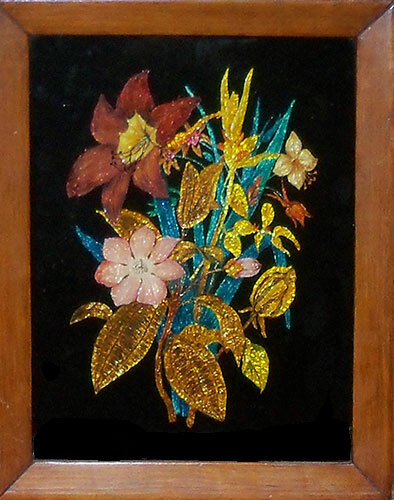 The reverse painting on glass on the back side is done with translucent colors and then embellished with crinkled foil to make the picture literally shimmer. This would have been especially effective in the Victorian homes that were lit with candles or gaslight. Strong composition and excellent condition. Circa 1840 - 1880. Size is 12 inches by 14-7/8 inches.